This year's banner proceeds apace. 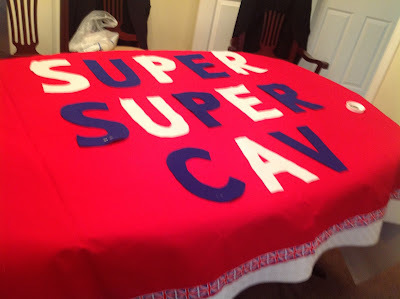 Unlike last year's reversible "Allez Wiggo/Super Super Cav" effort, this year we're going with a single-sided Cav banner, a fact which has nothing to do with various intractable positions being taken on whether side two should be in support of Evans or treacherous, treacherous Fwooomie. Honest.